The surprise victory in Britain of the campaign to leave the European Union may be spurring panic across the Continent (and among some regretful British voters), but “Brexit” has left U.S. home buyers with a very definable windfall: mortgage rates that are now the lowest they’ve been in more than three years. Electronic signature technology has been available — as far back as June 30, 2000 when President Clinton signed the Electronic Signatures in Global and National Commerce Act, which could reasonably lead one to expect that electronic closings would be used routinely by now. Yet, while more stages of the mortgage origination process continue to go digital, this is one stubborn piece of the puzzle that fails to follow suit. When you are purchasing a home (or any type of property) the last thing you are thinking about (unless you are a real estate attorney) is the title commitment. The focus is generally on the big ticket items such as purchase price, closing date, and inspection contingencies. However, almost every real estate purchase agreement provides for the issuance of a title insurance policy to the buyer (and buyer’s lender if applicable) and the title commitment is the title company’s promise to issue a title policy to you at closing. So why is the title commitment so important and why should you review it carefully? We may be on the verge of spring, but housing and economic reports work on a bit of a lag time. We’ve only just gotten the major data reports for January, and it’s giving us a clear-eyed view of how the real estate market is measuring up this year. And yeah, things are looking good. Morgan Stanley analysts last week predicted U.S. commercial real estate prices would grow by a big fat zero percent in 2016, replacing a previous forecast of 5 percent growth over the course of the year. It was a surprising prediction for a market which has seen prices easily blow past their pre-financial crisis highs. Values for office buildings, hotels, shopping malls and the like have appreciated rapidly in recent years, thanks in part to insatiable investor demand for higher-yield commercial real estate assets. 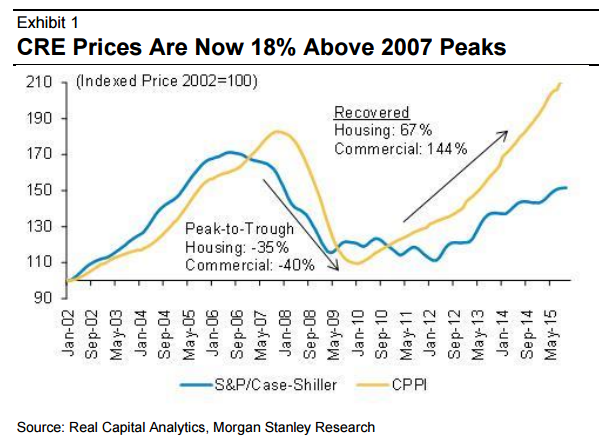 “The U.S. housing industry is being pulled in two directions. “Anyone who has purchased a home knows how stressful the closing of a mortgage loan can be. A typical closing — the meeting to complete the loan — involves signing stacks of legal-size documents laden with financial jargon. Borrowers may be anxious about the amount of money involved and worry about whether they understand the forms they’re signing. Document packages can total 100 pages or more, and closings can take hours.